Jackie has been a part of our team since November 2018. 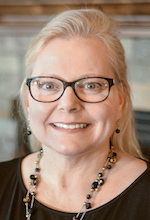 You will find Jackie in our billing office where she can answer any and all insurance and billing questions, thanks to over 30 years of dental experience. She has been married to her husband Doug for 35 years! Jackie and Doug have 3 kids; Kyle, Taylor and Katherine. When not at the office, she spends her time with her husband and their church community. Her favorite pastime is reading. Help us give a warm welcome to Jackie.